Political marketing is big business. In the 2012 U.S. Presidential Campaign, Barack Obama, Mitt Romney and their respective political action committees spent over a combined $2 billion on advertising in a one-year span. Those advertising budgets would place both the Obama and Romney campaigns amongst the highest spending advertisers of the year (only AT&T and Verizon spent more than $1 billion on advertising in 2012). Political campaigns have evolved to become less about ideology (product), and more about the brand strategy and brand articulation (packaging) of a candidate or party. Consistent with this paradigm shift is the reality that voters are consumers, and political advisors are increasingly required to think like brand managers, evolving their messaging mix to reflect the tastes and preferences of the public by focusing on social media and other forms of interactive content. And while political brands have evolved their marketing mix in recent years, one key marketing platform remains unchartered to those seeking high office: sports sponsorship. And while it may be a stretch to suggest we will soon see rinkboards that say "Justin Trudeau, official Prime Minister Candidate of the Ottawa Senators", S&E explores the potential benefits that could be incurred if political brands (hypothetically) embraced sponsorship as a new medium; one that could humanize candidates by offering them a platform to connect with voters over a shared passion. Political Campaigning & Sport- A Love Story: While it may not have been in an official sponsorship capacity, politicians have historically been quite active in their attempts to leverage the power of brand association in sport for their own political gain. Elections are ultimately popularity contests, and the key to winning them is for a candidate to strike an emotional connection with an undecided voter; it is undecideds who decide who wins and who loses when most of the population has already made up their mind. Politicians often attempt to do this by appearing "relatable" or "likeable"; sports (a hobby/interest held by the average, common person) is often the mechanism for them to do so. Whether it be Presidents throwing out a ceremonial first pitch, taking in a game on a campaign trail, or participating in sports with their colleagues, all of these activities are about leveraging the equity of sport in efforts to achieve a positive brand transference. However, what if this were to materialize in a formal sponsorship relationship? 1. Authenticity – For political brands, association with properties that are relevant to their constituents / voter base and can be leveraged to reinforce ideology / brand positioning (ie: multicultural festivals to communicate inclusiveness, sport properties to communicate a commitment to health care / healthy living) 2. Equity – Brands leverage sponsorship to gain a transference of key brand attributes from the sponsored property to the sponsors brand. Political brands are no different. "Optimistic". "Forward-thinking." "Innovative." The brand attributes that leading, Tier-1 companies hold are the same attributes sought after by candidates. 3. Differentiation – In a world where voters are blanketed with "Candidate X Supports this Message" 30-second spots, sponsorship represents a less intrusive, ownable platform for political parties and candidates. Sponsorship can also provide political brands access to unique and exclusive rights versus rivals. 4. Access to targeted demographics – Sponsorship can be leveraged for direct connection and engagement with participants and fans where there is alignment of target market (demographic or psychographic). 5. Reach – As a pure marketing platform, sponsorship can offer a candidate or party brand exposure and association through media assets, on-site exposure, PR and a community presence. 6. Employee Engagement – Campaign success can hinge on the passion capital of thousands upon thousands of volunteers and staffers. Political organizers can leverage sponsorship to ignite and inspire employees / volunteers through the forging of a deeper connection to their passions. Risk Profile and Key Considerations: While there may be brand-building benefits for those in political circles to invest in sponsorship, such investments would not come without risk. From the perspective of the sponsorship property, soliciting partners in a "Political Party" sponsorship category could result in large segments of the fan base feeling alienated. While sports and politics have historically been linked, teams and leagues are usually explicitly non-partisan. That being said, while teams and leagues may be explicitly (or outwardly) non-partisan, it doesn't prevent them from taking sides. According to ABC News, in the U.S., "the National Basketball Association has poured more than $2.2 million into elections since 2009, 61 percent of which went to Democrats. The National Football League, on the other hand, has heavily favored Republicans, with 58 percent of the $2.8 million that NFL team owners, executives and players have donated going to conservatives." Perhaps it will take a politically-inclined or outspoken owner to use team - not personal - resources to take an ideological stance. Case Study: The fact that political brands haven't historically engaged properties to pursue sponsorship opportunities hasn't prevented properties from pursuing political sponsors. In 2008, the Barack Obama campaign was pitched to sponsor a NASCAR team. While originally considering the opportunity, the campaign declined. The proposing team used a foreign car brand (Toyota) and the sport has a tendency to support more right-wing candidates: two contributing factors to no relationship being formed. 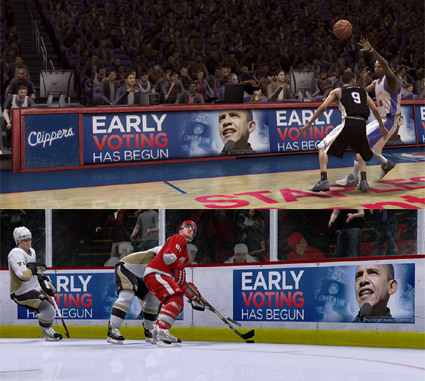 However, in 2008, the Obama campaign did in fact leverage video-game sponsorship as a tool educate a younger demographic on early registration for voting. Further, within the political landscape, elected governments have begun to leverage sponsorship to push their legislative agendas. The Obama administration partnered with a number of music festivals and the NCAA Championships to educate Americans regarding registration deadlines for Health Care exchanges.